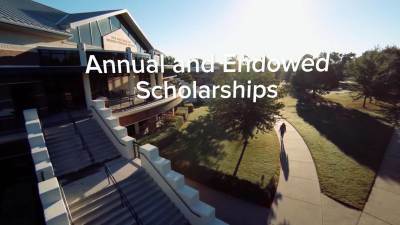 Hear about how annual and endowed scholarships will continue to help students recieve a Christ-centered education at JBU. Our donors love JBU students. That's what motivates them to give, and an endowed scholarship is something that they can give to you today, and they know it will continue on for generations to come. When I applied to JBU, I wasn't really sure how I was going to pay for it. Because of these scholarships, I've been able to learn things about the Christian life, in the context of JBU, that I can't imagine having learned somewhere else. Rather than thinking about giving to the University, it's investing in students lives. I always had a dream to go to college, but if the scholarship was not there, that dream would have definitely been dashed. Our students have the opportunity to meet those donors. It's a wonderful experience just to talk with them, see how they graduated from JBU, and what they've done with their lives, and how they've definitely impacted me and will be impacting me for years to come. When people give to the JBU scholarship fund, they're giving directly to students, to where they can go out in the world and make a difference. It wouldn't have been possible if God had not used these scholarships to bring me here, and keep me here, and He did it through the people who were generous enough to donate.